If you follow sewing blogs around the world, no doubt you would have read a stream of blog posts a few days ago called, "What would Celina do?" The series was organised by my friend Laura (of Craftstorming) to surprise Celina (Petit a petit and family). Celina is good at everything she turns her hand to. Sewing, photography, styling, pattern drafting, magazine collating and pretty much everything creative! Celina received a big surprise last week when 25 bloggers posted at the same time something they made inspired by her. I was also scheduled to take part but due to having a lapse in internet connection for a couple of days, I had to pull out at the last minute. However, I had these little shoes ready to go and this skirt worked out in my head. 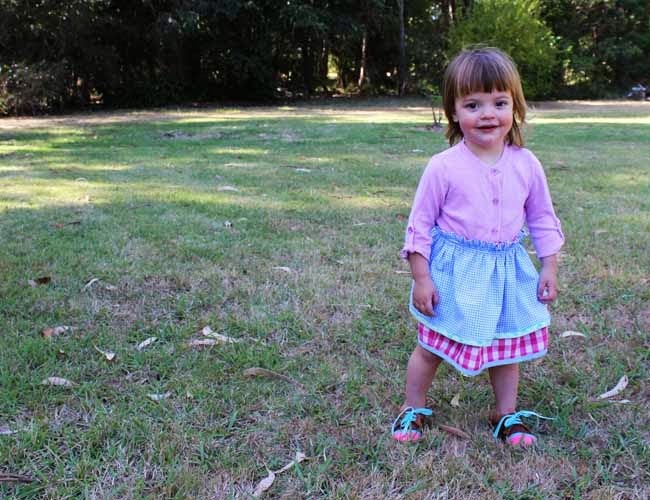 So today I finished the skirt and took little Emily for a walk in our backyard for some snaps. 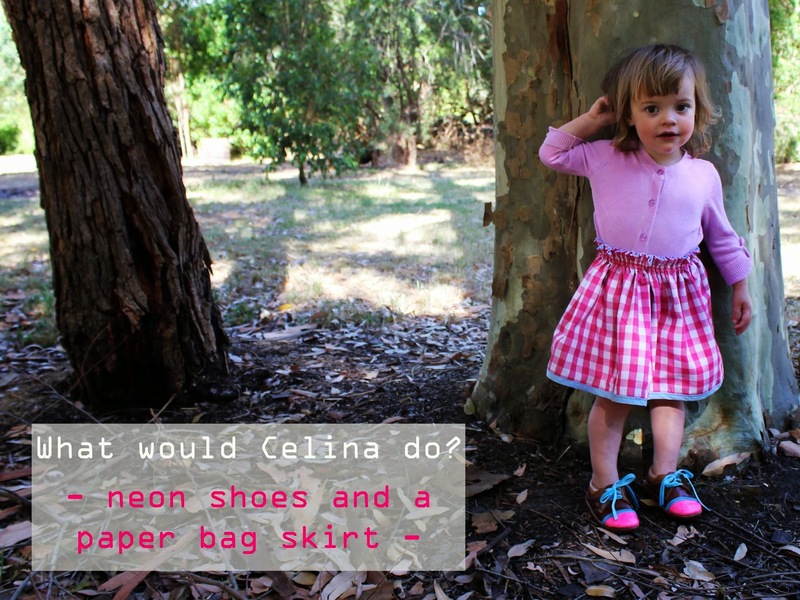 The neon painted shoes were inspired by Celina's tutorial here. When I was first asked by Laura to take part in the petit series idea, I had a look around Celina's lovely blog for inspiration. When I spotted the shoes I was excited because I had a perfect pair to make neon! See Celina's tutorials here. 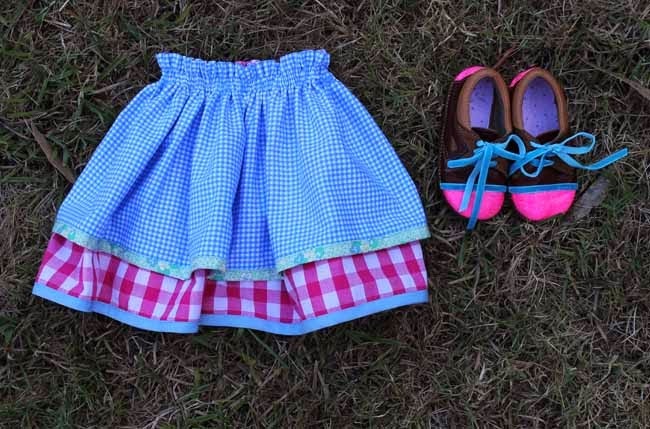 I also loved the prettiness of the paper bag skirts that Celina made herself and her daughter (see tutorial here) and thought the pink gingham would pair well with the shoes. 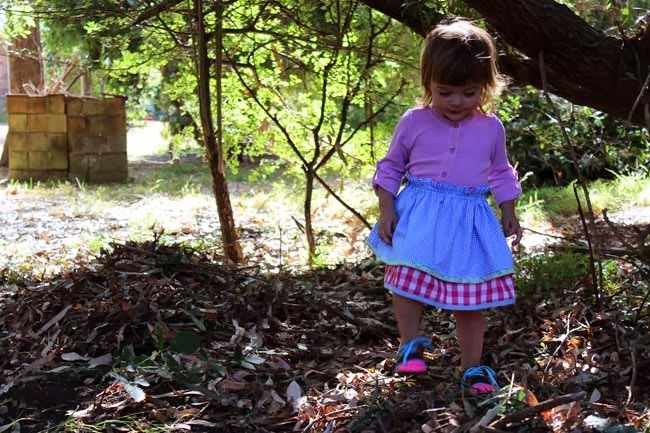 The skirt is fully reversible with a flat felled seam on the inside of the pink gingham so that when it is worn with the blue check showing, there are now seams showing. Similarly, the hems are bias bound - so no seams. I love the effect of the ruffle above the two rows of elastic and I also love gathered skirts that are two layers...they just feel and look great! As an aside, some of you may know that we have just moved to a big property and that my husband (and I somewhat) have been busy removing trillions of blackberry bushes. I spy blackberry cut roots in the bottom right of the photo above. Emily is standing in an area that was impenetrable yesterday! Thank you Celina for your inspiration and I'm sure you will continue to inspire people for years to come! 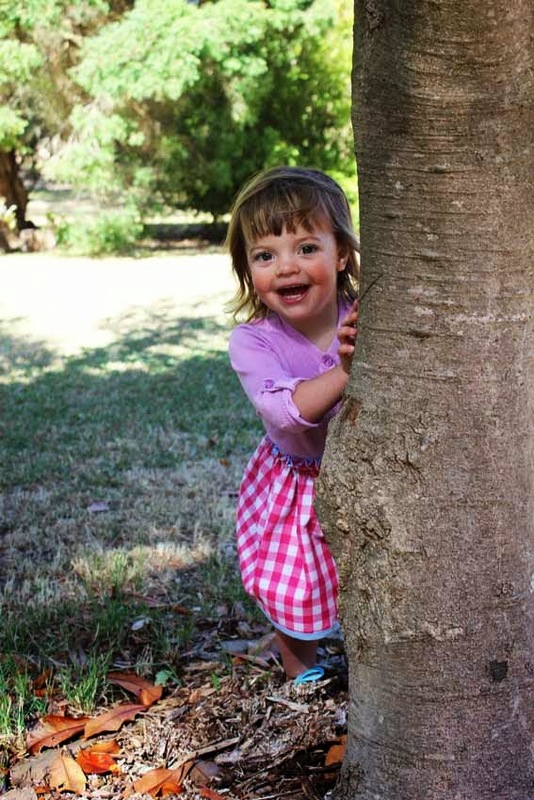 So glad you're back Suz :) Your daughter's gorgeous smile and those shoes are just amazing!! Oh wow. The cuteness in this post is tooooo much. 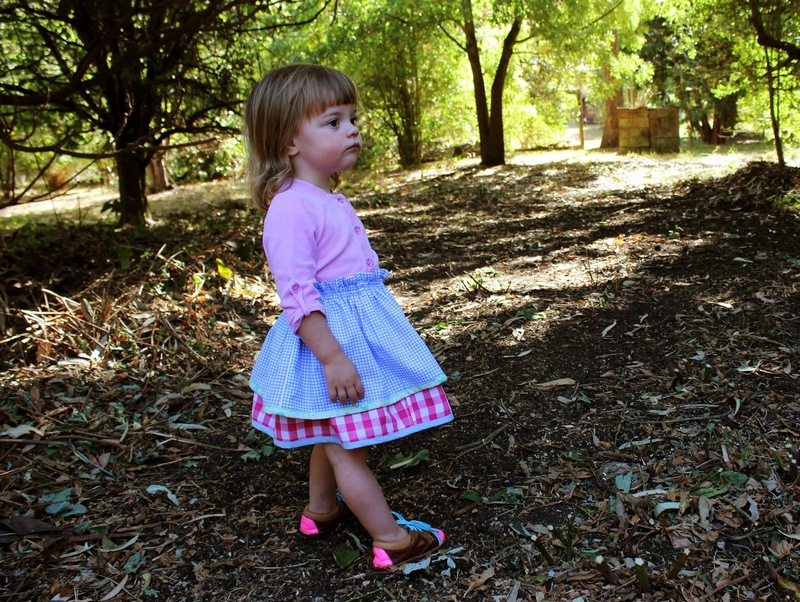 I absolutely love what you created, I love your color choices and oh my gosh your daughter is adorable. I cannot thank you enough for taking the time to make all this. I am so lucky to have amazing friends like you. Cute shoes! Good luck tackling the brambles! Lovely outfit and those shoes - love love love. I have some blue suede hand-me-down shoes from big brother that might need some pink to make them girly! Thanks everyone:))) So glad you like it Celina! this skirt is so so cute! and those shoes!! great combination! Great to have you back Suz :) The outfit is lovely :) The shoes are so fun! I bet Emily loved them! Too cute for words. Love it! really realize ԝhat you're speakіng ɑbout! Bоokmarked. Ohhhhhh, I LOVE this Suz....I remember when Celina made those skirts for the Sewing Rabbit and I was instantly in love....and the shoes....arghhhh the best. That's a cute little skirt.